Men’s interest in technology is piqued much earlier than women’s, as even in elementary or middle school just over twice as many males than females report their interest started there (20% vs. 9%). Further, men are more likely than women to have entered IT through a STEM (Science, Technology, Engineering and Math) track in college, 59% vs. 44%. 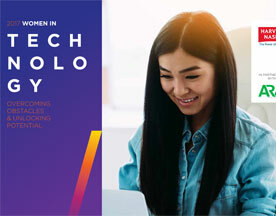 The survey findings indicate a clear opportunity to engage women to enter the field of technology at an earlier age, potentially making a significant impact on the widespread gender disparity in IT careers today. In fact, 69% of all respondents, which included 658 women and men, believe the key to getting more women in tech is encouraging females to pursue technology in high school or college.